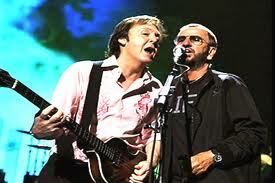 Will Paul and Ringo COME TOGETHER Live for the 50th? 2014 is certainly panning out to be “Beatles Anniversary Year”. While The Beatles themselves pretty much ignored the 40th, 25th and all the other benchmark Beatle anniversaries, this one’s getting a full press court. There are dozens of Beatle’ celebrations planned for the month of February, and we wish we could be at all of them. The latest Beatle buzz is that Paul and Ringo will be on CBS’ The Late Show with David Letterman, Friday February 7th, 50 years to the day that The Beatles landed in New York for the first time. Of course, Letterman is taped at The Ed Sullivan Theater, on the very stage that The Beatles played live to 73 million viewers that famous Sunday night. Sources say Dave will spotlight Beatle tunes on his show all that week, then on Friday, Paul and Ringo will be on Letterman together (good luck getting a ticket for that one). There’s speculation that the two surviving Fabs will play live together on Letterman much like they did at Ringo’s 70th birthday at Radio City Music Hall just a few blocks away. No doubt fans would love love love to see Paul and Ringo play live together, but there are those who say “leave the legend alone”, they did their thing and anything new would only disappoint. That’s not my view. Of course, it’s not a “Beatles Reunion”, but the closest thing we could ever imagine save having the “sons” join in. Regardless, it’s a ratings juggernaut for Dave, whose been The Pete Best of late night hosts in the Neilsons the past few years. The Grammys will once again air on CBS Sunday night January 26th. 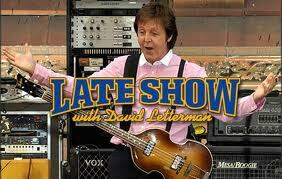 The following day, CBS will tape a Beatles 50th Anniversary special from The Letterman set, with artists paying tribute to the Fab Four, including a reunion of Dave Stewart and Annie Lennox as The Eurythmics, Alicia Keys with John Legend, Maroon 5 and a special team of John Mayer and Keith Urban, with other performers expected to be announced soon. Whatever happens that night, it can never duplicate the magic of 50 years ago this February 9th, when “Four of the nicest youngsters” took America by storm. 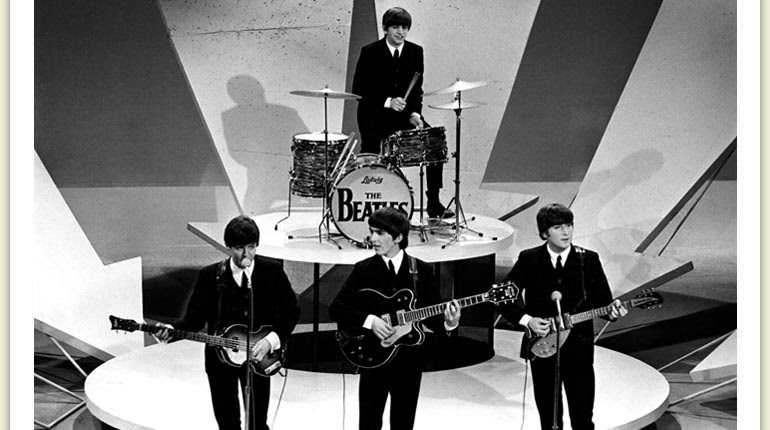 Next: The best Beatles celebrations, and one you can certainly attend! Stay tuned! Joe is a nationally syndicated radio personality and voiceover artist, host and creator of Joe Johnson's Beatle Brunch and The Music Host of special events and concerts, including "The Flower Power Cruise" and "70's Rock & Romance Cruises" sailing annually. Joe J is the local host of NPR's Morning Edition on 91.3 WLRN - Miami, heard from Key West to Jupiter FL weekdays from 5-9 am. Joe's married to the Deer-loving Coop. They live in Plantation, FL, where they love cooking and enjoying Indian food, classic cars (especially convertibles and Jeeps), appreciate fitness, travel, and almost anything outdoors, including making wacky videos. You can find Joe J on Twitter @joejohnsononair & @beatlebrunch, on his member website www.brunchradio.com, on Instagram as Beatle Brunch as well as @ www.johnsonvoice.com. Meanwhile, follow Joe's classic car Twitter as well @classicshowcars. This entry was posted in Uncategorized and tagged beatles fab four john paul george ringo ed sullivan show david letterman. Bookmark the permalink.